Backed by over 70 years of expertise in their field, Jeffrey Bewley, George Day, & Joseph Taraba bring a unique mix of skill sets to compost barn designing and management consulting. Jeffrey Bewley researched freestall barn modernization. His PhD work under Dr. Mike Schutz at Purdue University focused on the application and economics of Precision Dairy Farming technologies. For 9.5 years, Jeffrey was extension dairy specialist at the University of Kentucky. During this time, Dr. Bewley worked with Dr. Taraba, Dr. Day, students, and farmers to establish new recommendations for compost bedded pack barn management and construction. He has been invited to speak and consult on this topic across the globe. Jeffrey is currently a Dairy Housing and Analytics Specialist at Alltech and a partner in CowFocused Housing, a consulting business for dairy facilities. Taraba grew up in Columbus, Ohio and attended The Ohio State University where he obtained his BChE, MS, and PhD in Chemical Engineering with biological kinetics focus. He recently retired from the Biosystems and Agricultural Engineering Department at the University of Kentucky which he joined in 1976 where he has been an Extension Specialist and Professor. His focus areas have been animal waste management, primarily for dairy cow production facilities; air quality from animal production facilities, treatment techniques for domestic drinking water quality; groundwater quality and non-point source pollution from agricultural land-use areas; and, for the last 9 years, on the management, ventilation and concept design of the compost bedded loose housing dairy barn facilities. 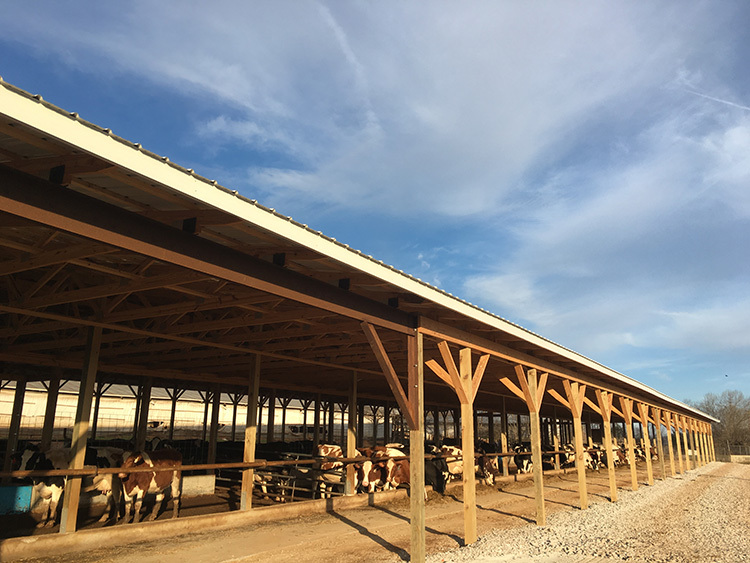 He has provided advice to dairymen globally and presented workshops and seminars on the compost bedded dairy barn, in the US, Europe and South America. Your cow's comfort is one of the single most important aspects of your dairy. Which housing option is right for you? Below we have separated publications by housing type. If you already know what will work for you then reach out and let us help you get started. The compost bedded pack barn is a housing system consisting of a large, open resting area, usually bedded with sawdust or dry, fine wood shavings and manure composted into place and mechanically stirred on a regular basis. A tie-stall barn gives each cow her own stall with bedding and free access to food and water in front of her in a manger. She is milked in her stall, alongside her herd mates. Afterwards she can be let out to pasture.